Rev. Chimesya has been the full time Prison Chaplain of CCAP Blantyre Synod for the last three years. Prior to his time as prison chaplain he was minister at the CCAP in Chiradzulu. Rev Chimesya has a real heart and concern for the physical as well as spiritual needs of the prisoners. 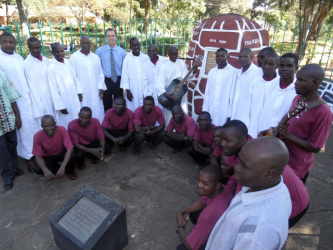 Former Blantyre Synod minister Rev Howard Taylor had a heart for Malawian prisoners. At his funeral in Glasgow in March 2013 funds were raised for the purchase of bibles for Malawian prisoners. 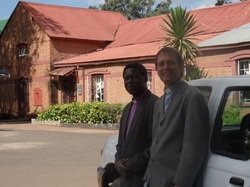 Blantyre Synod Prison Chaplain Rev Chimesya and Mr Douglas Taylor (son) will organise the distribution. Please watch this space for more information. The Friends of the Prison Ministry is a group of lay people from various churches who support the work of the prison ministry both practically and financially. Most ministers have congregations who help and assist the minister and his family in their work. The prison chaplain's 'congregation' are of course unable to visit the minister and his family. Instead the Friends of the Prison do this work. However, they also raise money for bibles, hymn books and the material needs of the prisoners. They also help with funds for fuel to allow the prison chaplain to visit many far flung prisons within the Southern Region of Malawi. For many years, the Blantyre Synod of the C.C.A.P. recognised the importance of creating this special ministry of the people who are in the crises like the inmates/ prisoners in order to fulfil the call of Jesus in Matthew 25 where he said I was sick, a stranger, naked, hungry, thirsty, prisoner, so the prisons are full of these people therefore the ministry is there in the prisons to serve these people who are in crises by comforting, encouraging, supporting them spiritually, morally, psychologically, materially etc. However, there was no full time Chaplain for the prisons and ministers were involved only on a part-time basis. In 2008, the Synod instituted a full time Chaplain to the prisons in order to take care of them in their spiritual and physical needs, following this ministry many inmates in various prisons have really given their lives to Jesus, life in prisons have changed with less escapees, fights, thefts, indiscipline and misconducts because of the approach we undertake to them as we do not condemn them as sinners no but most loved by God. Many spiritual activities are being done in the prisons like Choirs, dramas, overwhelming testimonies etc. I am the second full time Chaplain to prisons. On behalf of the Synod, I would like to thank the prison officials for their continued support whenever I need them, most especially in accepting the choir groups from the prison cells to gather and worship with members of the public in various churches am so grateful to them that they continue working hard in hard with faith based groups in the spiritual transformation of the prisoners in the country prisons. This year the Bible Society of Malawi has introduced a National Scripture Recital Extravaganza Project for all its member churches. The focus is on encouraging members to study and memorise the Bible verses for their spiritual enrichment. Members have been asked to memorise 300 Bible words. The project has also been extended to prison inmates to be championed by Blantyre Synod Prison Ministries. Following a very fruitful meeting I held with the Prison officials at the H/Q in Zomba in the month of April 2011, the Department of the Prisons welcomed the Project and promised to introduce it to all prisons. They asked Blantyre Synod to be part of the team who will be visiting the prisons to encourage the inmates to participate fully to allow them to win all prizes set for the project. Already the activities has taken its course especially at Chichiri Prison where three inmates have memorised 600 to 1,500 words from the Bible both in Chichewa and English. Very shortly upon availability of funds I intend to visit 13 prisons where I want to encourage more inmates to join the bandwagon. A joint effort between Blantyre Synod, the CCAP Friends of the Prison Ministry, the Prison Chaplain, an individual well-wisher and St Columba CCAP has resulted in 180 bibles and 150 hymn books being distributed around six prisons. Although this recent distribution was completed on 28th June 2012, the fundraising and distribution is a continuous process. St Columba congregation donated 184,000 Mk and an individual supporter donated 170 bibles. Altogether six prisons benefitted from this work. Depending on the numbers of inmates in cells, between five and twenty bibles were donated to each cell. A single leader within each cell, who has been trained in bible study and related activities, is responsible for the use of the bibles. The prisons visited were Bvumbwe, Makande and Thyolo prisons (all in Thyolo district), Luwani prison in Neno district and Mwanza and Mulanje prisons. The 'Friends of the Prison Ministry' provided a car and funds for fuel, Blantyre Synod provided funds for the fuel to get to Mulanje prison. In addition to the spiritual needs of the prisoners the Prison Ministry is deeply involved in providing for the physical needs of prisoners. Moral and spiritual counselling to both male and female inmates, the old and the youth. Assisting inmates to pursue their legal matters by directing them to Para Legal Offices. Cheering the sick inmates in the hospital where they have been admitted and in the prison cells. Organising church groups to visit the prisons of their choice in order to offer materials and give words of encouragement and love of God to them. Conducting and leading regular church activities on Sunday, bringing the inmates closer to the Lord Jesus. Conducting weekly Bible studies sessions for their spiritual growth while in the prisons. Conducting Holy Communion sessions and Baptisms to the repentant inmates. Donating second hand clothes, medicines, beddings, Bibles and other things through well wishers and members of Friends of Prisons. Since last year the Blantyre Synod Prison Ministry involved itself with a group known as FRIENDS OF PRISONS BLANTYRE SYNOD. 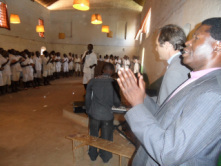 A programme of Bible Study Sessions in the prisons was launched, especially in the Southern and Eastern Regions of Malawi where there are 19 prisons. The project has successfully been completed in all prisons with funds both from Synod and members of the Friends of Prisons. Friends of the Prisons are always supporting the ministry by making monthly contributions. Thanks should be given to them and the GIDEONS INTERNATIONAL for their donations of the New Testament Bible Version to each inmate and Officers in all visited Prisons. The Bible studies and Bibles are helping them to deepen their spiritual life, growth and relationship with God, hence making them to leave a positive life to their own and their fellow friends, they are so encouraged when sharing the massage from the Holy Book as they see God as a Caring, Forgiving and Loving GOD. We visited Dr Kim (pictured second from the right) who is working at a prison which is also a farm. Dr Kim is from South Korea and there is a very interesting agriculture and prison joint venture between the Malawi Prison Service and a Korean charitable organisation called 'Crops of Love'. We arrived at the prison (not an office as I had expected) with a nice view of a river flowing past and beyond some new school buildings. "Those were built with money raised from the sale of crops" is something like what I thought Rev Chimesya said. Following a huge prison work of reaching the inmates in various prisons a Project Proposal asking for an assistance of funds to procure a second hand twin cab vehicle was written and sent to some well wishers in Canada (International Ministries Of Presbyterian Church Of Canada). They were touched by the work which Blantyre Synod are carrying out in the prisons and sent us 8.3 thousand USD to purchase a vehicle. We bought a NISSAN DOUBLE CABIN. I thank the International Ministries of Presbyterian Church of Canada through Ron Wallace for supporting the ministry of Prisons in the country. The vehicle has already started easing the communication and travel problems I have been facing for more than two years. The only challenge will be probably funds for gasoline (Petrol) and maintenance.